Michael Phelps is an American Swimmer born in 1985. He is taking part of the 2012 London Olympic Games. At the age of 7 years old Michael was a little scared to put his head underwater. 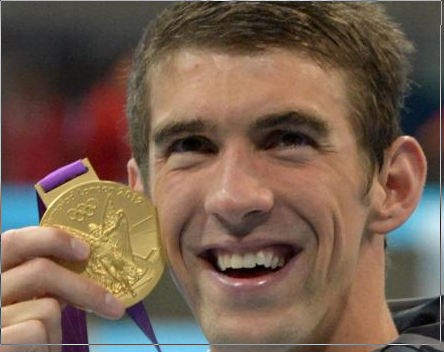 In the month of July 2012 Michael Phelps won his 19th Olympic Medal. He now has more medals than gymnast Larisa Latynina’s previous record of 18. He won 19 Olympic medals so far. He won six gold and two bronze in 2004. He has now won one gold and two silver medals at the 2012 London Olympics. The gold medal was in the 4 by 200 meter freestyle relay. Michael Phelps has been an huge inspirational to thousands of swimmers all over the world.